1. For coleslaw: Combine sour cream, mayonnaise, cilantro, green onions, lime zest, lime juice, sugar, salt and pepper in a medium bowl; mix until smooth and creamy. Add cabbage and toss to combine. Refrigerate until ready to use. For fish: Combine chili powder, lime juice, oil, cumin, onion powder, garlic powder, salt and pepper in a small bowl. Rub all over fish. Let stand 20 minutes for the fish to absorb flavor. Preheat grill to medium-high. Oil the grill rack or use a grilling basket. Grill the fish until it is cooked through and easily flakes with a fork, 3 to 5 minutes per side. Transfer the fish to a platter and separate into large chunks. 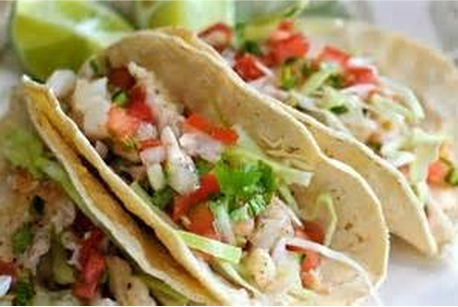 Serve the tacos layered with fish, tortillas, coleslaw and avocado.